Seaberry | Scuffalong: Genealogy. Seaberry – Scuffalong: Genealogy. And with that introductory email began my fruitful and thoroughly enjoyable correspondence with B.H., my third cousin, twice removed. Our common ancestor was Levisa (or Eliza) Hagans Seaberry, mother of Napoleon Hagans (B.H.’s great-grandfather) and Frances Seaberry Artis (my great-great-great-grandmother). In the spring of 2010, B.H. and I entered into a mutually beneficial exchange of information about our shared family. I had little information about Napoleon beyond what I’d found in census records and deeds, I’d lost track of his sons Henry and William, and I was completely unaware of his son, the accomplished Dr. Joseph H. Ward. He cued me into William S. Hagans‘ post-migration life in Philadelphia, shared amazing photographs and documents, and lead me to “discover” Joseph Ward’s early years. In turn, I introduced B.H. to Wayne and Wilson Counties and the lives of the Haganses, Wards and Burnetts before they recreated themselves up North. This past weekend, I traveled to Detroit for — astonishingly — the first time ever. Our primary purpose was to take in the city’s rich street art culture, but I added an item to the top of the agenda — meeting B.H. 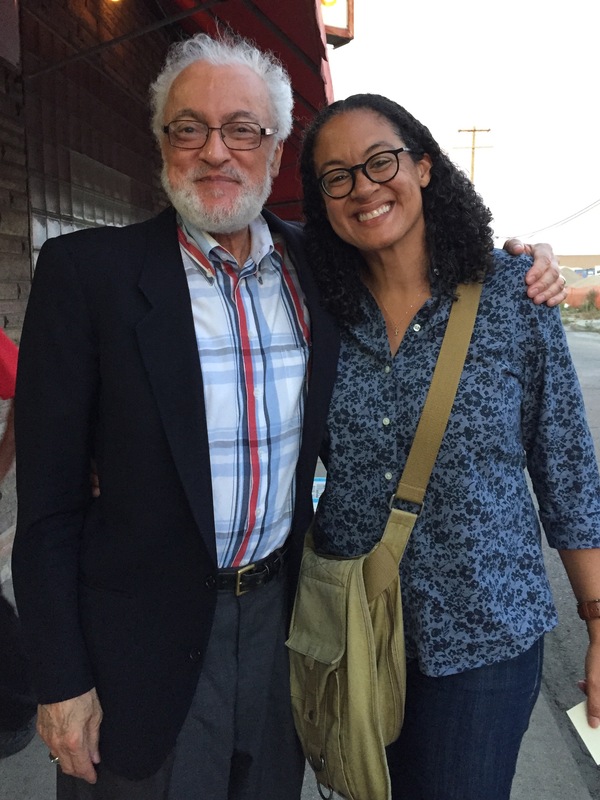 Friday night, he and his wife treated us to dinner at an old and storied restaurant near the city’s Eastern Market, and Levisa’s children came full circle. Our colored friend has grown richer. 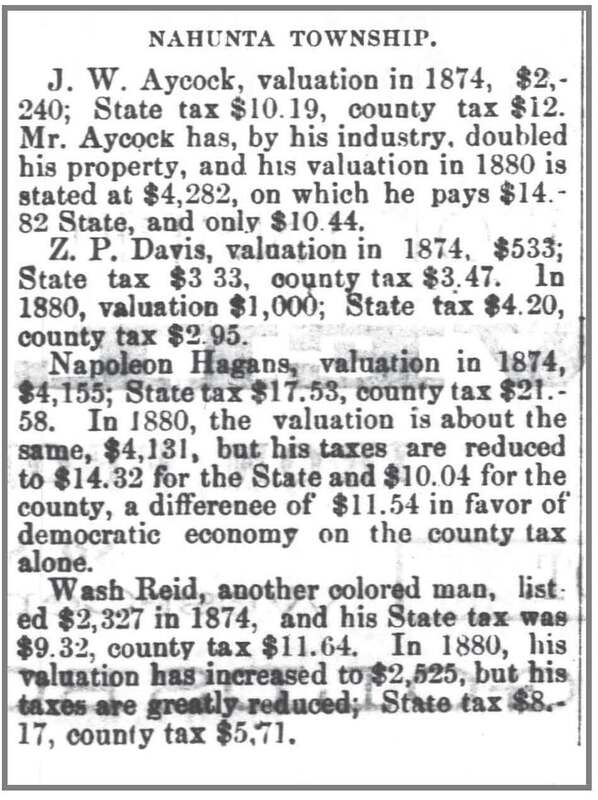 Goldsboro Messenger, 21 October 1880. Two of the “colored friends” noted were my kin — my great-great-great-grandfather Robert Aldridge and Napoleon Hagans, the brother of my great-great-great-grandmother Frances Seaberry Artis. (And Washington Reid’s nephews William and Henry Reid, sons of John Reid, married Adam Artis’ niece Elizabeth Wilson and daughter Cora Artis, respectively.) Aldridge, Hagans and Reid (as well as Artis, Frances’ father Aaron Seaberry and Betty’s father John Wilson) were all prosperous free-born farmers. The sixth in a series of posts revealing the fallability of records, even “official” ones. Adam Artis had about five wives and 39 children. His first legal wife was Frances Hagens of Eureka. She was very fair and had beautiful long black silky hair. Frances Hagans. By the early 20th century, that this was Frances Artis’ maiden name was accepted wisdom. When four of her children — Vicey Artis Aldridge, Napoleon Artis, William M. Artis and Walter S. Artis — died, their informants replied “Frances Hagans” when asked the name of the mother of the deceased. Researchers find these records and dutifully set down her name this way in the innumerable family trees of her innumerable kin. But Frances Artis was not born a Hagans. She was a Seaberry, as her earliest records attest. She is Frances Seaberry, daughter of Aaron and Levisa Seaberry in both the 1850 and 1860 censuses. Most tellingly, it is the name Adam Artis gave the registrar when he applied for their marriage license in 1861. How, this mix-up? It is a case of transferral. 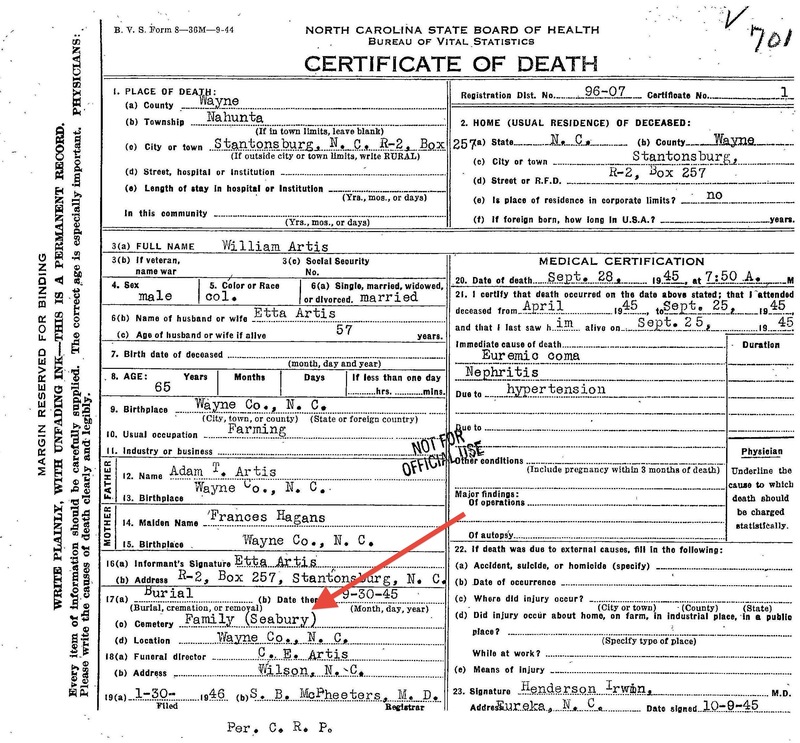 Frances’ mother’s maiden name was Hagans and gave birth to a son, Napoleon Hagans, before she married Aaron Seaberry. Napoleon Hagans grew to become one of the wealthiest “colored” men in Wayne County, larger than life, feared and respected by black and white alike. Given the shadow that Frances’ brother (probably half-brother, in fact) cast, it is not surprising that 50+ years after her death, her descendants assumed that she was a Hagans, too. DNA Definites, no. 9: Hagans. 23andme characterizes K.H. as my father’s first cousin (8.11% share) and my second (4.4% share). We are related via my Henderson and Aldridge lines, and much more closely in the latter. He is, in fact, my father’s first cousin, once removed. K.H.’s mother and my father’s grandfather were siblings. Sometime around 1845, probably in northern Wayne County, Levisa Hagans married Aaron Seaberry. She brought a young son, Napoleon, to the marriage, and he possibly brought a teenaged daughter named Celia. The first documented free colored Seaberry was 8 year-old Henry Seaberry, who was apprenticed to Simon Copeland in Wayne County on 19 May 1803. In 1820, Henry Best apprenticed 6 year-old Rufus Seaberry and 8 year-old James Madison Seaberry. Four years later, Best apprenticed 7 year-old Melvina “Viney” Seaberry. What was these children’s exact relationship? Theophilus Seaberry. Known as “Offie.” He was born about 1806 and married a woman named Rachel (possibly Smith.) The family lived in the Saulston area and included children Kenan (1833), Serena (1834, married Calvin Artis), Eliza (1835, married Lawrence Sampson), Aaron (1840), Litha (1842), Vicey (1843, possibly called Rebecca), Henry (1847), Theophilus jr. (1849), Milly (1850, married Rensnow Pace), John “Jack” (1851) and Rufus William (1853, married Della Mitchener). Offie probably died between 1860, when he appeared in the census, and 1862, when five of his children were apprenticed. Nicey Seaberry was born about 1810. She headed a household in Wayne County in 1840 and 1850 and appeared in other county households in 1860 and 1870. Her children may have been Mancy (1833-1914), Angeline (1835, m. Mike Faithful), Exeline “Exey” (1840, m. William H. Hagans), Joseph (1842), Elizabeth (1846-1870), Mary (1855, m. Jordan D. Best). James Madison Seaberry was born about 1812. He and his brother Rufus were apprenticed to Henry Best in 1820. Henry Seaberry was born about 1815. He was apprenticed twice: to Simon Copeland in 1822, and to John Alford in 1833. Melvina Seaberry. Known as “Viney,” she was born about 1817 and was apprenticed to Henry Best in 1824. On 27 August 1866, under a law designed to legitimate slave relationships, she and Joseph Carroll, though both freeborn, registered their 21-year cohabitation. Their children: Hannah (1833), Daniel (1836), Joseph (1838), Charity (1840), Willis (1842, married Caroline Whitehurst), Nicy/Nancy (1844), Jin (1846), Melvina “Viney” (1849), Delilah (1850), Ruffin C. (1853), and Tamar (1857). Aaron Seaberry was born about 1818. Around 1844, he married Lovisa Hagans and became stepfather to her son Napoleon Hagans. He and Lovisa had one daughter, Frances, born 1845 (married Adam Artis). Aaron died 1900-1910. 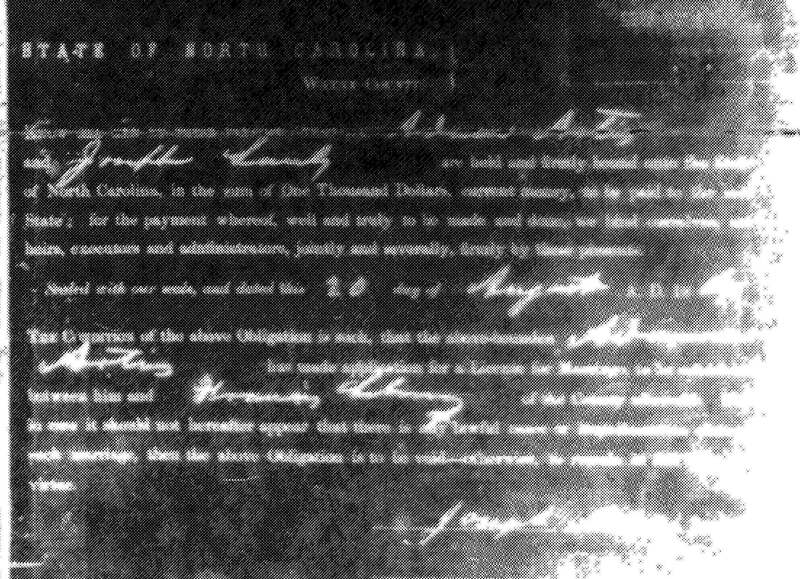 Raleigh Seaberry was born circa 1824, “six miles from Goldsboro,” as he testified to the Southern Claims Commission. He lived near Averasboro, Harnett County, during the far, and settled in Cumberland County after. He married Emeline Manuel circa 1846. Their children: James Madison (1848, married Marianna McNeill), Sarah E. (1850), Smithy Jane (1854, married James McNeill), Eliza (1857), Leah (1859), John M.F. (1860), Nicey (1863), Raleigh (1866), and Lemuel (1871). Adam Artis’ children, part 3: Frances Seaberry. This is a nice starting point, if not entirely accurate. Frances Seaberry was Adam’s second legal wife. If he had 39 children, not even his last surviving daughter could name them. Her half-brother Napoleon Hagans never owned slaves, though he had many tenants, and he cast a shadow large enough that his sister’s descendants thought his last name was hers. Ida Artis was born about 1861. (And was not Louvicey’s twin.) She married Isaac Reid (1853-?? ), son of Zion and Lucy Reid, about 1876 .Their children were Frances Reid (1877-??) and Lorenzo Eli Reid (1879-1952). Ida Artis Reid died 1880-1900. Napoleon Artis, known as “Doc,” was born 28 February 1863. He married Sallie Taylor; their sons were Humphrey, Leslie and Odell. Doc died 16 October 1942. His descendants still live on land along Route 222 between Stantonsburg and Eureka once owned by Adam Artis. Louvicey Artis was born in 1865 and married John Aldridge in 1879. Their 11 surviving children were Zebedee Aldridge, Lula Aldridge, Frances Aldridge Cooper, John J. Aldridge, James Thomas Aldridge, Amanda Aldridge Newsome, Beulah Aldridge Carter, Correna Aldridge Newsome, Catherine Aldridge Davis and Christine Lenora Aldridge Henderson. Vicey Artis Aldridge died 13 February 1927. Louvicey’s twin, Eliza Artis, married Haywood Everett. Before 1900, the couple migrated to Arkansas and settled in Lonoke County. They had no children, and Eliza died 10 October 1936. Georgeanna Artis was born 1867. She married Henry Reid (1859-1930), son of John and Mozana Hall Reid (and first cousin to Isaac Reid, above) on 29 Nov 1883. Their children: Alice Reid Williamson, Cora Reid, William H. Reid, Brodie Reid, Lenny Reid, Nita Reid, Henry N. Reid, Linda B. Reid, and Georgia Reid. She died 18 August 1923 in Goldsboro NC. Adam Toussaint Artis Jr. was born in 1868. He married Rena G. Wynn in 1893 in Wayne County and had one son, Lafayette. He migrated to Washington DC, and married Agnes West in 1904. Their son was Harry L. Artis. Haywood Artis was born in 1870. He migrated to Norfolk, Virginia, in the 1890s, and married Harriet Hawthorne. Their children included Bertha Artis, Jesse Artis, Hattie Artis Johnson, Mae Willie Artis, Haywood Artis Jr., and Charles Artis. Walter Scott Artis was born 2 October 1874. He married Hannah E. Forte. Their children: Napoleon Artis, Beatrice Artis, Estelle Artis, Adam Toussaint Artis III, and Elmer H. Artis. Walter Artis died 25 June 1951. William Marshall Artis was born 28 August 1875 and married Etta Diggs. Their children: Margaret Artis, William M. Artis Jr., Frances Artis, Irene Artis Carter, Adam H. Artis, Fletcher Artis, Doris V. Artis, Haywood Thomas Artis and Beulah M. Artis Exum. William died 28 September 1945. 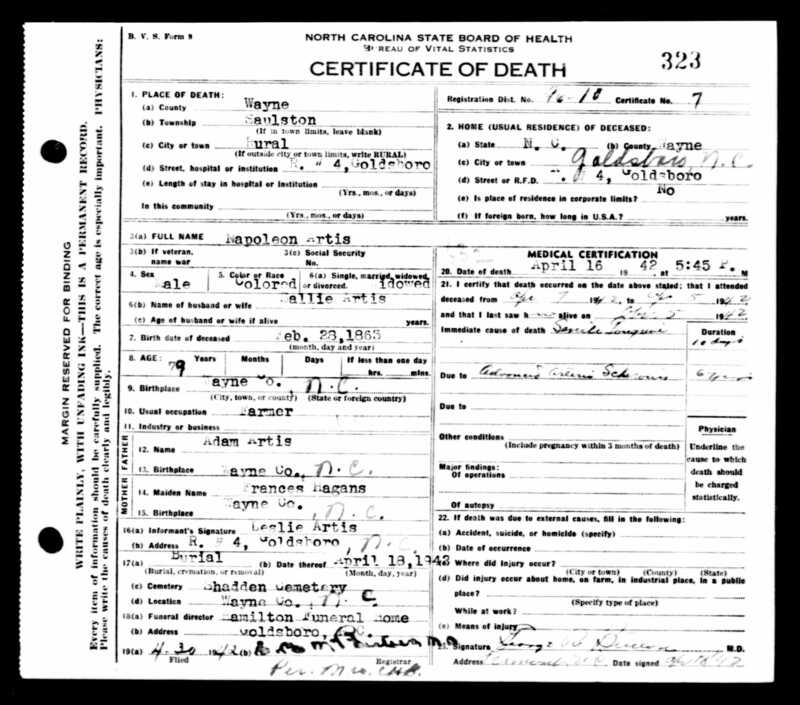 Jesse Artis was born in 1878, presumably not long before his mother’s death.